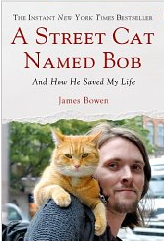 A Street Cat Named Bob was a very sweet story about two homeless creatures, James Bowen and a ginger cat, finding each other and providing each other with unconditional love. More than that, it gave insight into James’ backstory – how he lost his way, became a heroin addict, and found his way back. Sure I like cats, but I found James’ backstory much more important. I liked the insights given into why James became a heroin addict – pure and simple loneliness was his explanation. He was alone without family or support, and heroin was his friend, allowed him to anesthetize himself to his isolation. He felt invisible to all those walking past him on the streets of London, until there was a pretty ginger cat on his shoulder. As James sat playing his guitar on the street for money in Covent Garden, or then sold magazines outside the Islington Tube Station, James found that Bob stopped the rushing commuters, lightened their day, and also their pocketbooks. Bob has been a goldmine for James. And James has taken care of Bob in return. Nice, cute story. Now, how can we help all those homeless or helpless people in our society that we rush past, as there’s nothing soothing and purring there to look at? This book made me more aware of strays – whether animal or human – and I found it more valuable in that way than just as an entertaining read.